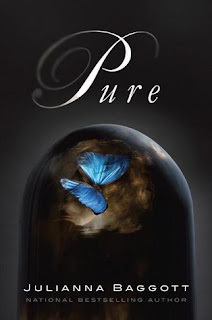 This YA trilogy started popping up on several blogs and sites I read. Since I'm always looking for more audiobooks to take on my dog walks, I put holds on all three. The world has collapsed under some sort of nuclear attack. Society has been split in two - the "pures" in the Dome who were protected from the blasts; and the "wretches" who live outside and suffer illness, mutations, and deformities as a result of the attacks. Those who made it to the Dome promised to return for those outside, but many outside are skeptical and resentful. Pressia lives with her grandfather outside the Dome. Her hand was fused with a baby doll's head and her face was burned during the attacks. She is 16, and age at which her life becomes far more dangerous. Partridge, son of one of the Dome's designers, lives inside the Dome. His mother died trying to bring those outside to safety, and his older brother committed suicide. Both begin to question society as they know it, are brought together, and decide whether they want to protect their ways of life or fight for the hope of something better. Baggott creates a unique cast of characters, and her rotating between several points of view is natural. She focuses on characters impacted by the blast and how their lives, and society around them, have been reshaped by their mutations. I was surprised by the turns the book took, and enjoyed them all. Bonus points for clever plotting & mythological references. My one complaint is the romances. Perhaps they're obligatory in YA, but they felt underdeveloped, circumstantial, and unrealistic. It would've been a stronger novel without them. Verdict: Affirmed. Not a crossover stunner, but if you're a fan of post-apocalyptic YA, it's definitely worth checking out. I'm moving straight to book two. "Pure" by Julianna Baggott, published February 8, 2012 by Grand Central Publishing. Audio narration by Khristine Hvam, Joshua Swanson, Kevin T. Collins, and Casey Holloway, published on February 8, 2012 by Hachette Audio.